Once while having a conversation with a weaver in the cold winters of 2013, three youngsters found themselves questioning the weaver about why his sons weren’t taking up weaving and were wasting their ‘hunar’ aka skill. The weaver replied with a rhetorical question...”why are you yourselves not carrying on with the family business but are choosing to climb corporate ladders across the world instead?” Their families had been in the weaving business for over two decades and these three had decided to not carry it on any further. The hypocrisy of their own advice to the weaver was apparent to them and they decided to take action, well to at least give it a good think. 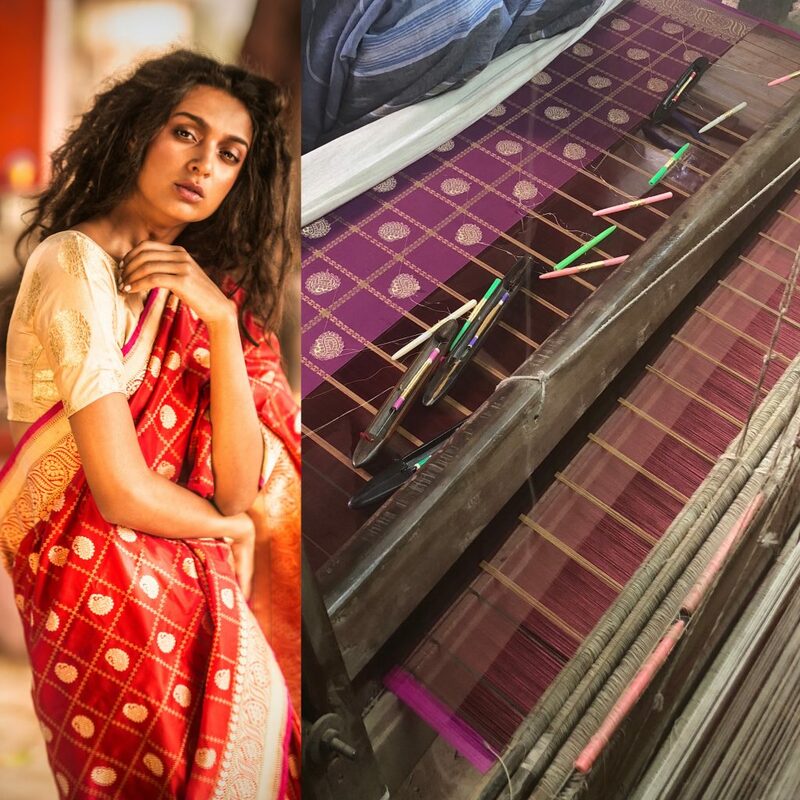 Thanks to the above conversation, Udit, Aditi and Ujwal, decided to work on their own advice of following in the family’s tradition and thus, Tilfi was launched in 2016 with a vision to re-introduce the Banarasi sari to the world, with a strong desire to not just let the Banarasi handloom simply survive, but to ensure that it thrives. Who makes the team Tilfi? Udit: A mathematics graduate from St.Stephen’s College, Delhi and an MBA from INSEAD, France. He brings experience in running multiple international ventures in the UK, Mexico and Kazakhstan. He is passionate about building Tilfi as a truly global, yet a resolutely Indian luxury brand. Aditi: A mathematics graduate from St.Stephen’s College, Delhi, a business graduate from XLRI, Jamshedpur and an MBA from INSEAD, France. She is a seasoned finance professional and entrepreneur, having previously worked in Investment Banking. She is the brains behind Tilfi and the one who brings method to their madness. 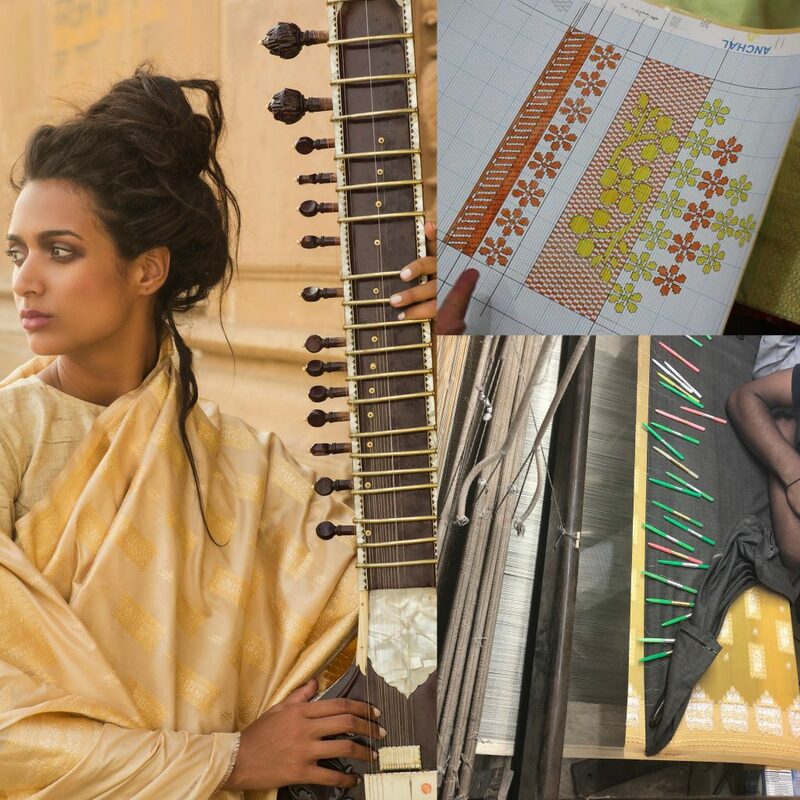 Ujjwal: A business graduate from Narsee Monjee, Mumbai, is the creative force behind Tilfi and now knows Banarasi textiles better than anyone. He is hands on with the weavers, thus ensuring that Tilfi continues to produce some of the finest handloom fabrics in the world. 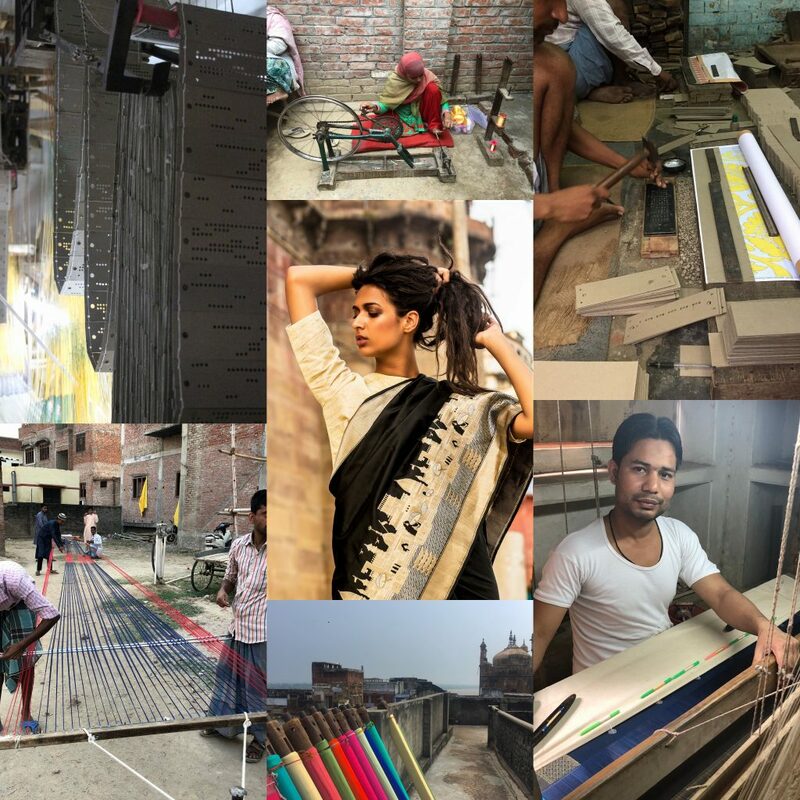 A combination of knowledge, respect for weavers and a desire to make Banaras’ fabric available and respected across the globe is what drives these three young entrepreneurs. They believe that all their products carry the quintessence of this holy city, its nooks and crannies, its chaos, beauty and timelessness. The team believes that each handloom masterpiece requires effort from multiple participants. Working across the complete value chain is most productive. Designers work on the design, it is then developed for weaving by graphers and ‘nakshabands’ and thereafter, commissioned to be woven by the weavers. Traditional designs that have been woven for centuries are preserved and so is the tradition of respecting and appreciating the work of the weavers. Providing stability to the weaving ecosystem is very important to Tilfi. 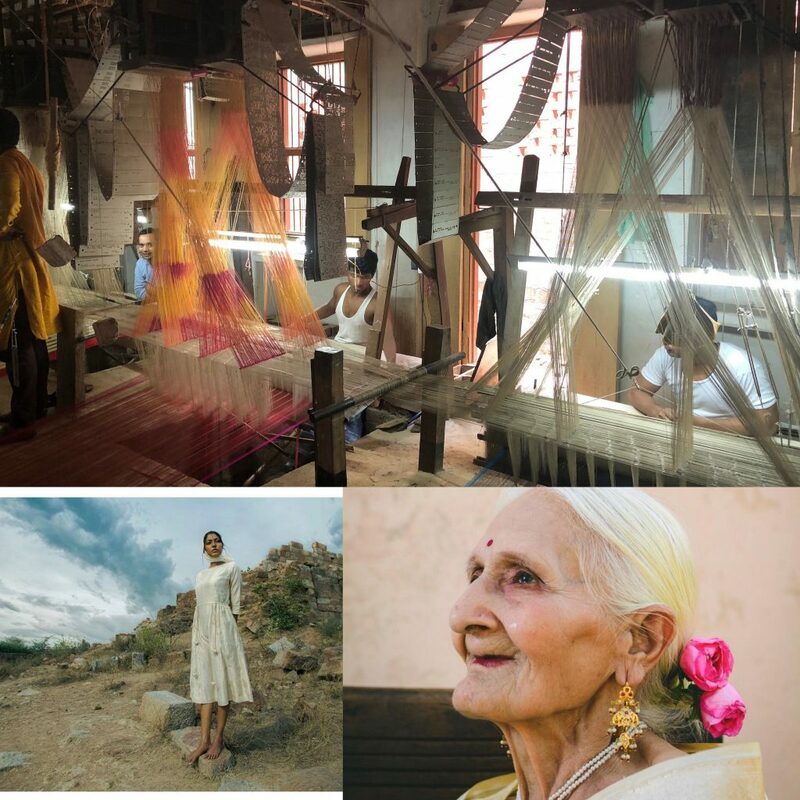 They understand that each sari represents livelihood for a weaver and by simply selling one-off pieces without the promise of continued support, they will not be able to sustain themselves or the craft; a simple truth that is core to their belief. If getting a heirloom sari from Tilfi wasn’t enough, you are now tempted by stylishly elegant suits and dresses too! All created using the most beautiful Banarasi weaves. There is so much to discuss about the different weaves, but that’s for another day. Though, a little browse of their website, would enlighten you straight away. Click here to read more. These three are walking the talk…walk with them and help spread the magic. Inspire & be Inspired…Be Notjustashopper!